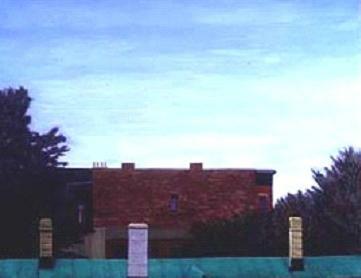 Giles continues to explore ways in which simple images such as landscapes or solitary buildings can be portrayed dramatically, to create a more theatrical presentation than conventional realism. Giles' use of color, light, and paint applications are her primary vehicles for conveying drama and emotional content. In some of the paintings, Giles has experimented with amplification of color, to resemble what she describes as the period after a rainfall when colors appear completely saturated and naturally more intense. The effect is further enhanced by a consciously lush application of paint to the panel or canvas surface. Giles' intent is to create a more immediate, direct connection between the viewer and the image through her handling of paint, reflecting her specific interest in the relationship between the quality and intensity of the painted surface, and the mood and meaning perceived by the viewer. Giles received her M.F.A. from Northwestern University, and has studied at the American Academy in Rome. She has exhibited her work at numerous galleries and art centers in the Midwest and Northeast since 1989. Her last one-person show at the gallery was in November 1998.